A new commentary series is being produced which appears to be worth your consideration: the Zondervan Exegetical Commentary on the New Testament. 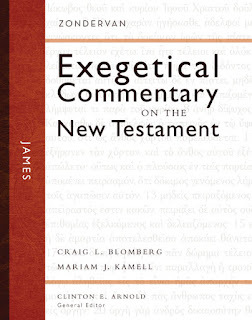 The first volume to be released is Volume 16 on the Epistle of James, by Craig L. Blomberg and Mariam Kamell. Having studied and taught through this epistle within the past few years, I was glad to find this new offering. I have not found a commentary on James with which I have been fully satisfied. Part of the reason is because I have not read them all. Another part of the reason is that most of the commentaries I have used either content themselves with suggesting that the Epistle of James as a loosely tied together string of commands and proverbial sayings, or identify a theme and/or structure that is only partially satisfying. Indeed, the Epistle is challenging to outline and I cannot boast of being on par with those who have written commentaries on this Epistle. However, I believe that there is a structure that does justice to the entire letter and a theme that ties all of the commands and proverbial sayings together. This new commentary seems to come very close, but from the sample, it is difficult to tell. Judging by what is provided in the sample, Blomberg and Kamell identify the topic of responses to trials and suffering in the Epistles opening section (1:1-11). The outline provided for 1:1-27 beautifully captures the symmetry of the text. The sample does not display this entire section so it is impossible for me to determine what they identify as the theme of the book, but it appears that they are on a track similar to that which I have followed. I am eager to find out if this is the case, or not. The support translation for this series is the TNIV (IBS/Zondervan, 2005). Bravo! I can't wait to check this out further. In their study of James, Craig L. Blomberg and Mariam J. Kamell introduce readers to three key themes that dominate the letter: (1) trials and temptations; (2) wisdom and speech, particularly with a view to obedience; and (3) wealth and poverty. Readers may be surprised to see how the famous passage on faith vs. works actually emerges from the more central topic of wealth and poverty. Replete with insights and timely theological applications, this commentary provides pastors, church leaders, and those in the academy with a complete, “one-stop” resource they need. Designed for the pastor and Bible teacher, the ZECNT brings together commentary features rarely gathered together in one volume. Written by notable evangelical scholars, each volume treats the literary context and structure of the passage in the original Greek. The series consistently provides the main point, an exegetical outline, verse-by-verse commentary, and theology in application in each section of the commentary. Please take a moment to read Kevin Stern's review at The Book Blog. It seems to me that we may be entering a golden age of NT commentaries. This looks like another great series. But while my library is filling up with these outstanding new volumes, I wonder why we don't see the same production from conservative OT scholars? My library is dreadfully thin in the OT section. The NIV Application series seems to be a bit helpful, but I only own one volume, so far. I wonder if Zondervan will be expanding this exegetical series to the OT. I can't find any word of this on their website.